We are situated close to famous Danube Cycle Route (Eurovelo 6), major cycle tracks at Donaukanal and Donauinsel are around the corner and the Wienerwald-area with great mountain bike trails is just some minutes away. Getting to bike20 by public transport: Take underground 6 to stop "Handelskai", then 10 mins walk or one stop with busses 5A or 11A. Directly to Friedrich-Engels-Platz with tram lines 2,31,33 and busses 5A, 11A..
Our shop entrance is at Kapaunplatz! At the moment we don‘t have regular shop hours. 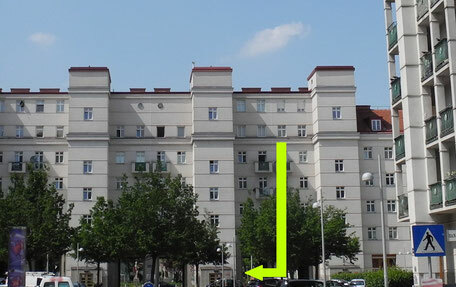 You arrived at Friedrich-Engels-Platz and you recognize that pic? 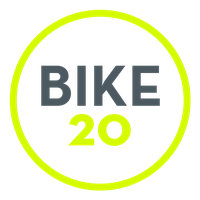 You're very close to bike20 then. 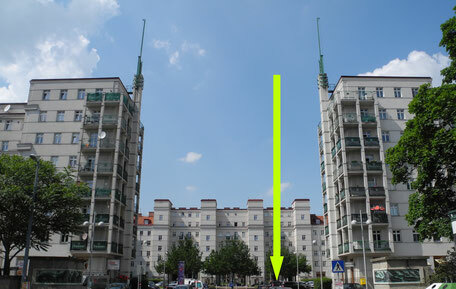 Follow the arrow and go through the passage (pic2, right-hand side) of the appartment building, then turn around. You should be at our shop entrance now.